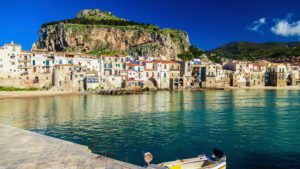 Cefalu, a delightful seaside town famous for its long beach of golden sand, the deep blue of the sea and its typical Mediterranean atmosphere with a hint of Arabian mystery, is the most exciting and charming resort in Sicily. Many tourists come every year to Cefalu attracted by the warm bright colours and the magnificent setting: beautiful small coves, creeks and beaches, sheer rocky cliffs which descend to the sea, olive groves, lemon and orange plantations which diffuse the intense fragrance of their blossoms, the mountainous woodlands. Nature’s wonders are counterbalanced by man’s creations : the impressive Arabo-Norman cathedral, the dazzling gilded mosaics of the Christ Pantokrator, the Ruler of All, the medieval wash-house, the enigmatic smile of Antonello da Messina’s Unknown Man. It is this perfect and harmonious synthesis between nature and art which makes Cefalu a truly unique spot. Strolling along the alleys of the medieval town centre, or sitting in an open air café slowly savouring a delicious ice cream, you can watch Sicilians going about their everyday life: women hanging out their clothes in the alleys, people holding lively discussions, gesticulating expressively, costermongers loudly touting their wares. You can become inebriated by the strong fragrance of the flowers and plants which give splashes of colour to the streets: bougainvillea, the seductive scent of jasmine and geraniums and the strong aroma of basil and mint. In the fish restaurants along the promenade or in the small trattorie hidden away in the alleys and courtyards of Cefalu you will discover Sicilian cuisine, which mirrors the history of the island of Sicily and the creative joie de vivre of its people. Deep in Sicily’s mountainous interior is the lush Madonie National Park, which offers endless opportunities for walking and excursions and where you can enjoy breathtaking views from the summit of Mount Etna to the Aeolian Islands. Here you will discover small villages nestling on the mountain slopes or crowning the summits, dominating the landscape, where you will meet people who still live as in times gone by: shepherds pasturing their flocks, farmers at work in the fields or on muleback on their way home, old women sitting at the door of their houses. Cefalu offers this and much more to the visitor, but it is for you to find it out! Rocca: A Greek myth tells of the love and despair of the handsome shepherd Daphnis, Sicily’s Orpheus. He was blinded by the goddess Hera whose daughter he had betrayed, and was transformed into the huge crag that dominates Cefalu and that gave the place its name. The ancient Greek inhabitants saw it as a gigantic head, and “head” is in fact the meaning of the town’s name. Temple of Diana: The temple of Diana, a megalithic building dating back to the IX century B.C., is the only pre-classical monument in Sicily. It was associated with the worship of Diana, goddess of the moon and the water. The Norman Cathedral: it is one of the most impressive monument of the Norman age in Italy. The interior is decorated with some of the most impressive Byzantine mosaics in Sicily representing the sublime figure of the Christ Pantokrator, the Ruler of All, His Mother and 53 other figures of saints. The perfect fusion of Arabic and Byzantine and Norman elements gives to the church its unique charm and magic. The medieval wash-house: At the mouth of the little river Cefalino is located the evocative Medieval wash-house whose basins carved in the rocks were used by the women for washing their clothes until recent times. The Osterio Magno: he was King Roger II’s palace at Cefalu. The three-mullioned window dating back to the 12th c. shows the perfect fusion between Gothic and Arabic architecture. The Corso Ruggero , the old town main street, marked the border of the town during the Middle Ages. Today the street is lined with baroque churches and noble palaces. The most elegant shops of the town can be found here. The old port and the Porta Pescara: At the old port there are the best views of the old town. Here is also located the Porta Pescara, one of the four gates of the medieval town. Antonello Da Messina: At the Mandralisca Museum is to be found one of the most beautiful and mysterious portraits by Antonello Da Messina, the Portrait of the Unknown Man (about 1470), whose enigmatic smile seems to have inspired Leonardo Da Vinci when painting his Monna Lisa.